The next time you book an appointment at Glastonbury Massage Center, you may want to consider incorporating CBD hemp oil. Any of our massages can be upgraded to incorporate CBD oil for an additional $15 charge. CBD (cannabidiol) has a myriad of health and wellness benefits that comes in several different forms. But when it comes to massages, CBD products fit perfectly. In fact, CBD topicals provide one of the easiest ways to take advantage of CBD’s benefits and can be used to target specific areas of the body that require particular attention for pain relief. 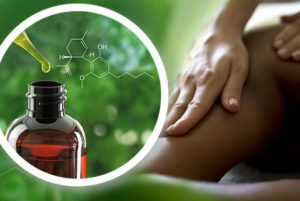 So, how does CBD benefit the body when incorporated into a massage? Before we get into that, let’s briefly talk about how CBD works in the first place. Unlike THC, which binds to CB1 receptors and inevitably causes a “high” as a result of its psychoactive properties, CBD has an indirect effect on both receptors without actually binding to them. This is why it doesn’t cause any mind-altering effects while still offering a wealth of benefits. When included in a massage, CBD’s interaction with your natural endocannabinoid system can induce a number of highly beneficial effects. Inflammation is essentially the body’s response to a threat to your health. In the case of physical trauma or strenuous activity, inflammation can arise in response, which tends to show itself in the form of pain, swelling, redness and soreness. CBD can help target and reduce inflammation because of its unique ability to indirectly interact with the CB1 and CB2 receptors of the endocannabinoid system. In particular, CBD has a bigger impact on the CB2 receptor that affects the immune system. Since the immune response to an outside threat is inflammation, CBD’s ability to target the CB2 receptor can effectively reduce inflammation. Improve skin health. When CBD is applied directly into the skin during a massage, it can actually promote skin health. Again, CBD’s interaction with the endocannabinoid receptors can help to reduce inflammation, often a culprit behind acne. It can also help to reduce the production of oil in the skin further reducing blemishes. In addition, CBD contains linoleic acid, which further helps to regulate oil production on the skin and stop breakouts.